Tournament Parser is a program that parses, "reads" and collects data from, Tournament Histories from poker sites and exports a customizable rail. This is a simple program to use and is very convenient for players who want to put in volume while not worrying about making a rail afterwards. 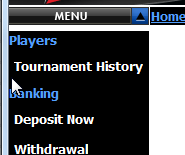 Winning Poker Network now supported. Email capability for rails is now functional. Enter the password that you used for the Audit File. Use the filter option or remove any touranments that are not needed. Click the "Generate Rail" button to generate your rail. How to use Tournament Parser with WinningPoker skin. 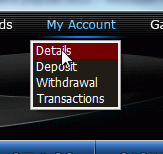 Select My account >> Details from the menu located at the top of the screen. Select Tournament History from menu located at left of the page. Fill in information and hit submit to view tournament history. Copy the information on the page, hold the CTRL key down on your keyboard and press the A key. Next, copy the whole page by either right clicking with the mouse and choosing copy or hold the CTRL key and press the "C" key. In the box on Tournament Parser, right click using your mouse and choose "Paste" or hold the CTRL key and press the "V" key. This will paste the source from the FTP tournament history page.